We have to say, the Motorola Defy brings some fun to the handset market. 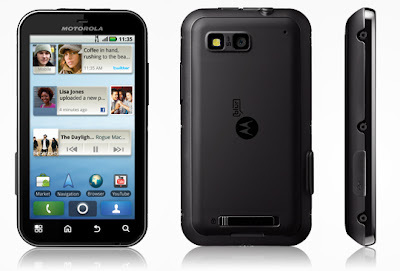 Okay, it is not as classy as the Moto Milestone or Samsung Galaxy S, but that's because it is encased in plastic to offer a shock-, dust- and water-resistance that they don't. It's reminiscent of a zebra, with a white edge strip and rubberised matte-black front, which should mean it stands out if you drop it when you're in the great outdoors. Generally, ruggedised phones put their all into being indestructible, sacrificing looks, a decent display, a good snapper and a nifty set of features in the process. The Defy tries to do both - okay it's not as highly protected as the Sonim Solid Extreme for instance, and it doesn't have top-of-the-range features, but they are better than those found on most tough handsets. Tough and smart is quite something to achieve in the mobile phone world. The Defy manages to stay pocket-sized, although it has a bit more girth than your average Android phone. The designers have tried to disguise this a little by sloping its sides, and while it can't claim to be as svelte as the iPhone 4, it is far shorter, even though it has a 3.8in display. You won't be surprised to hear that all edges are sealed - on the volume rocker and power switch and the pop-out plugs for the 3.5mm headphone jack and micro USB charger. The battery sits behind a sliding lock cover, which has small edge screws along its sides, to add to the feel of industrial chic. The huge display takes over the front of the device, apart from the four Android buttons that sit in touch-sensitive lights underneath it. It's the best-looking Motorola handset we've seen for some time. The display looks pretty decent. It's multi-touch and, while it's not up there with the AMOLED screens (colours can look a bit pale), it has an excellent resolution of 480x854 pixels. To add to its tough credentials, the display is made from Gorilla Glass, which should keep bumps and scratches at bay. So that's enough about the Defy's looks. What about its performance? As we're sure you're aware, capacitive displays work by conducting the electricity from your finger to the screen, so if the display is wet, it won't operate so well. iPhone fans may well already have discovered this. That aside, the Defy survived our clumsiness well - we dropped it on the floor a few times and even let it slip into a puddle. Once we'd wiped it down, the Defy carried on working and looked as good as new. The Defy boasts an impressive (for a tough device) 5 megapixel camera, complete with LED flash, and though it performed okay, it was disappointing in low light. We were happy with video recording, although there is no HD offering. But hey, you can't have it all. The version of Android the Defy supports is 2.1 - not the latest incarnation, so you might miss a few of the fancy additions. However, it does have the benefit of MotoBlur, a very decent social network aggregator, which gathers together your Facebook updates, messages and tweets and places items in widgets on the screen. Rivals have taken over MotoBlur recently, but it still remains a fun-to-use interface. There are seven screens, all of which have plenty to do. One has an icon for recent messages as well as contact shortcuts, while another features a media playback widget, as well as a help shortcut should you need any aid actually using the handset. Then there are Favourites, Contacts, Camera and several other buttons - all sitting at the bottom of each screen. Mind you, you can always dump them if you don't want them there. And we did like the useful bar of switches, to turn on and off flight mode, GPS and Wi-Fi should you wish to. While the Defy may not have a speedy 1GHz processor onboard, its 800MHz model seems to run pretty quickly. The battery life compares well with most of the other big-name Android devices, and will easily get you through the day on a full charge. Anyone who's a tad clumsy and has lost a smartphone in a pint of beer, or, even worse, down the toilet, might like to consider this tougher device, which combines ruggedisation and some fancy features. Motorola often manages to surprise us - and after bringing out a number of somewhat disappointing devices, by producing a handset with brains and brawn, it has done just that with the Defy.